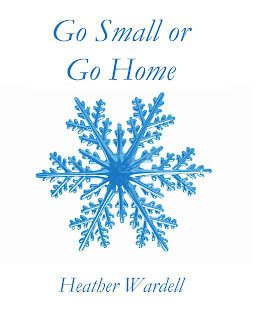 Heather Wardell, Women's Fiction: Go Small or Go Home - GONE! Go Small or Go Home - GONE! To be precise, it's gone to Smashwords.com and is now available! As part of this year's "Read an e-Book Week" I have just released Go Small or Go Home at SmashWords.com. What's "Go Small or Go Home" about? When massage therapist and aspiring miniatures artist Tess begins treating stressed but attractive hockey star Forrest, her art career soars due to his gallery-owning mother, but her creativity plummets under the weight of rules and deadlines. Soon, she's lost the freedom and joy she'd always found in art. Is having her dream career worth losing doing her art her way, or can she somehow have both at once? From March 7-13th, you can get my book, and a great selection of others, for free or at a discount from SmashWords.com and their "Read an e-Book Week" catalogue. There are other great books available at the "Read an e-Book Week" site. I am happy to be making a second book available, and I hope you'll check it out. In time, it will be available at amazon.com and other online retailers; when that happens I'll be sure to let you know. In the meantime, pick up the book this week for free at SmashWords!